The Eurotherapy Classic is a high quality oscillating-pad therapy massager, designed by German engineers and health professionals to bring the benefits of physiotherapy to your own home. FREE UK delivery. Weighing just 1.4kg (3 lbs) with a sturdy 1.3kg carry case, this lightweight, robust product comes with an optional heat setting which quickly reaches 40°C for gentle localised muscle and soft tissue therapy. With the product placed in the lower half of its carry case, this enables easy self-use and comfortable hands free massage of your hands, feet, shoulder, upper or lower back, neck, hip, thigh, knee or joints. The carry case can hold the Eurotherapy Classic securely in a number of positions, whilst allowing you to continue with your normal activity of watching television, reading or handicrafts. The balanced ergonomic design allows for convenient one-handed use, and a range of accessories tailor the massage to your own requirements. The powerful 45 Watt motor oscillates at 2,870 rpm and yet is quiet enough not to be intrusive to others around you. A variety of attachments allow for a range of therapeutic uses from scalp, reflexology and cosmetic soft tissue use to deep penetration massage. The soft bristle pad and ball studded reflexology pad both attach by simply placing them over the base plate and allowing the sides to locate in a groove. The cosmetic sponge, soft bell, and domed deep penetration attachments, all locate in a high quality stainless steel threaded insert in the base plate. The coiled power cable stretches to a length of three metres (10 feet) for convenient use without having to be immediately next to a power socket. When not in use the power lead will recoil back to its original length. Weighing just 1.4 Kg, the Eurotherapy Classic is light enough for easy transportation, yet sturdy enough to provide effective use. Its convenient weight and size does not impair its performance, as many professional users will attest. A useful hand grip is moulded into the front of the product for two handed use, should you require the services of an assistant. This is also a feature particularly appreciated by the many qualified physiotherapists that use the Classic. Is it only for professional use? It was initially developed for professional use and has proved its worth in many clinics across the UK, however it is now available on the domestic market. Can I use it on my own? Yes, its ergonomic design and well balanced body allows for easy and convenient one-handed use. It can also be placed in the lower half of the carry case and used in the sitting position, in the back or side of an armchair. I’ve seen similar things cheaper, why is this more expensive? This is a very high quality product designed and built to professional standards. Its robust case and body have a Nylon content that resists small bumps and will not crack with age. The powerful motor and heating element have had rigorous testing and proved reliable over many years, even with daily use. It meets the exacting standards of TUV quality control. How is it different to other similar looking products? The Eurotherapy Classic has been carefully developed to utilize an oscillating action which moves at 2870 cycles per minute. This more closely replicates the movements you may experience when visiting a professional Physiotherapist and is one of the reasons why it so many positive user testimonials over many years. Is it a proven product? 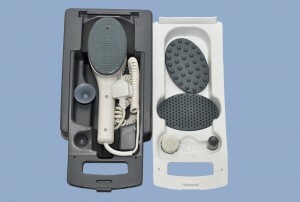 This product has been on the market for over 20 years and has proved to be a very reliable and effective massager. It displays German engineering quality and meets TUV manufacturing criteria, which is even more stringent than British Standards. Do professional Physiotherapists really use the Eurotherapy Massage Classic? Yes, Physiotherapists have been very complimentary about our product and use it in a wide range of applications where deep massage is required. Yes, all Eurotherapy Classic devices have a warranty of two years. There should be no need for any servicing during its lifespan. Many of our customers have had their massager for over 10 years without any problems whatsoever. There are no user serviceable parts in the Eurotherapy Classic and it should not be taken apart for any reason. In the highly unlikely case that it develops a fault during the warrantee period just return it to us. Replacement accessories are available from our Head Office. Contact us for further details.